Play the Beloved Card Game with People All Over the World Anytime! Who doesn’t love UNO? With the easy-to-learn rules and the myriad of ways you can mess things up for your fellow players, there’s a good reason why it’s been one of the most beloved card games for the past 40 years. For the first time, the game is now ready for players all over the world to challenge one another. All the rules of standard UNO apply in UNO & Friends. All your favorite cards and strategies are back in full force for this digital edition. If you’re not familiar with the game, then fear not. UNO is easy to learn. Play a card that matches either the number or the color of the last card played. Reverse the direction of turns with the Reverse card. Skip over the next player’s turn using the Skip card. Force players to draw more cards with Draw 2. Change the color to whatever you like with the Wild card. Make a sucker draw four cards as well with the dreaded Wild Draw 4. Win the game by getting rid of all your cards first. Hit the UNO button when you’re down to your last card or face the consequences. Challenge and bluff other players into drawing more cards. With UNO & Friends, you no longer need to get your buddies together with a deck of cards to start a game. All you need to do now is activate the app and go online. Join the worldwide community of UNO players and discard your cards anytime and anywhere you like! Personalize your avatar, background, cards and more. 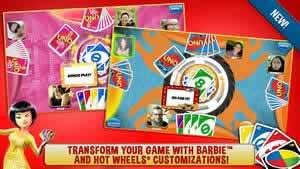 Play games with up to four human players online. Host your own lobbies to play UNO your way against your buddies. Link to your Facebook or Google+ account to play with your friends easily. 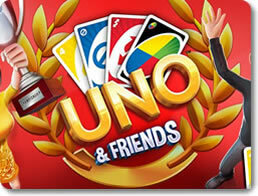 Climb the online leaderboards and show everyone how much of an UNO master you really are. Features weekly contests and events. Win them to acquire glory and other fun prizes. UNO is as fun and addictive as ever, and UNO & Friends updates it for the 21st century in all the ways that matter. Gone are the times when you had to wait and plan for a game ahead of time; now you can just connect and start laying the smackdown on other players with those nasty Draw 4 cards anytime you like. 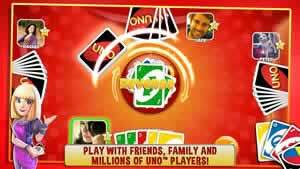 You’ve been dealt a very good hand with UNO & Friends; all you need to do now is download and play it.